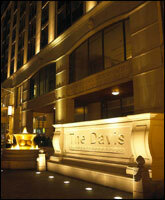 This Davis Bangkok is a new boutique hotel with luxury villas, set in the heart of the Bangkok business district. Bangkok's first boutique hotel is unique in almost every sense of the word. Nearly all rooms are designed with different themes and, if you wish, you can experience a different style almost every visit. We have installed a wireless environment for your convenience and this access is spread through the ground floor (housing the Gallery Cafe and Club 88, our jazz experience), as well as throughout our meeting rooms where the IT availability will really enhance your meeting potential. Other modern equipment is also available with unique 'white boards' in each meeting room. Our guest room size starts from 42 square meters and all rooms have separate bath and shower cabinet units. Each room also has flat screen television as well as a mini component VCD/CD player as standard. A fax line and data port is located near the work desk. A broad selection of amenities greets you along with makeup/shaving mirror, hair dryer and an extension telephone in the bathroom. Our superior rooms are luxuriously appointed and the only limit is choice. There are 7 Thai villas with 2 bedrooms and 3 Thai villas with 3 bedrooms with a floor area size of 164 and 250 square meters respectively. - High speed internet access with secure phone lines with speakers and voicemail. - Laptop/Fax/Printer set up on request. 25" Flat Screen TV with remote control featuring a full selection of local and satellite TV channels. - Refrigerator mini bar for all rooms with complimentary drinking water, and for suites, a kitchenette - four ring cooker, microwave oven and sink. Gallery Cafe - Featuring creative International and Thai Cuisine favorites a la carte menu with Culinary buffet. All day dining. Club 88 - A meeting place as well as a place to take a drink after work to unwind. Hors d'oeuvres served during happy hours. In Room Dinning - Meal service 24 hours a day choose from the a' la carte selection in this folder. Private Chef Service is also available and applicable for rooms with their own kitchenettes. Same day service for dry cleaning, laundry and pressing, express service is also available. - Private Spa with 8 treatment rooms. Business Hours : 7:00 to 21:00 hrs daily . - Mobile phone and laptop rental. - Full selection of office equipment. - Facsimile, photocopy and courier service. - Built-in wall screens, built-in dimmer, sound amplifier, LCD projector. - Flip charts , slide projector, DVD/VCD player.